Happy Vegan MoFo 2014, everyone! I am very excited to kick off my theme for this year, Disney movies. I’ll have a good mix of old and new, plus popular and obscure Disney films to feature yummy dishes from. To start off, we’ll stick with a 90’s classic, Toy Story. In the original movie, Woody and Buzz Lightyear get stranded in a gas station, but manage to snag a ride to the Pizza Planet restaurant/arcade in search of their owner, Andy. I’ve always loved the idea of this kind of space-themed Chuck E. Cheese, so it inspired me to make pizza from it! Since most kids seem to drift towards classic cheese pizza, I decided to lay low on the veggies and keep to the theme. I was quite proud of this pizza, due to everything being homemade. 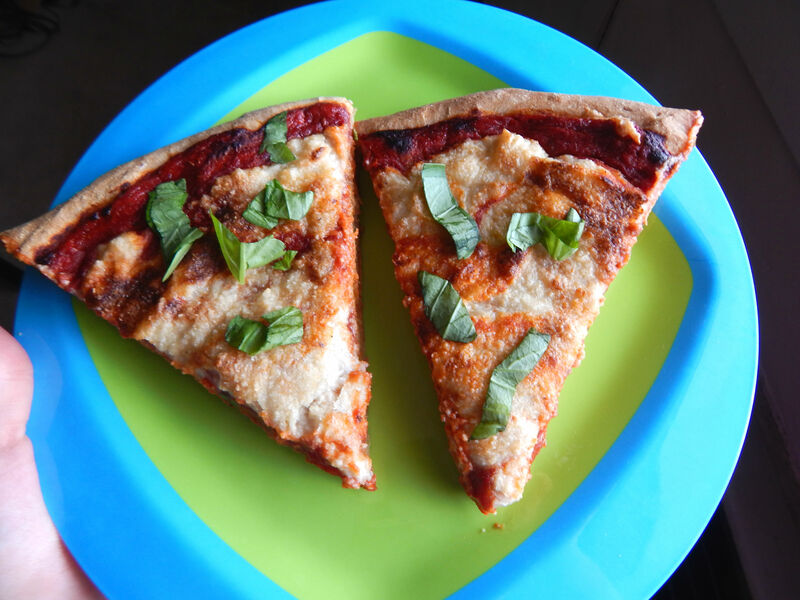 I used a whole wheat crust (which Peter proclaimed delicious), oil-free pizza sauce, and cashew mozzarella cheese with a sprinkle of fresh basil from my windowsill. The pizza sauce turned out a bit on the sweet side, but everything else was great. The crust was chewy and used only whole wheat flour, so there was no guilt with making it. I was skeptical about the cheese, but once baked it firmed up and had a good texture for those craving cheese pizza, but not wanting to splurge on store-bought vegan cheeses. I may play around with the agave ratios in the sauce next time I make this, but I’ll definitely be baking up this pizza again. Oh god this looks PERFECT. I will have to follow your lead with that cashew cheese, it looks very much like cheese pizza when it is reheated the next day – which was my favourite way to eat it! Thank you! Yeah, when baked it kinda became stiff like reheated pizza. No stretch to it, which would put off some people, but I liked it. I agree, that looks really delicious! Most definitely. Pizza’s versatility is one of the things I love about it.